LCD TVs are definitely the most common TV available for consumers these days, and, with the demise of Plasma, most think that LCD (LED/LCD) TVs are the only type left. However, that is actually not the case as another type of TV is available that actually has some benefits over LCD — OLED. OLED stands for Organic Light Emitting Diode. OLED is an outgrowth of LCD technology that uses organic compounds formed into pixels to create images, without the need for extra backlighting. As a result, OLED technology allows for very thin display screens that are much thinner than traditional LCD and Plasma screens. OLED is also referred to as Organic Electro-Luminescence. OLED is similar to LCD in that OLED panels can be laid out in very thin layers, enabling thin TV frame design and energy efficient power consumption. Also, just like LCD, OLED is subject to dead pixel defects. On the other hand, although OLED TVs can display very colorful images and one weakness of OLED versus LCD is light output. By manipulating the backlight system, LCD TVs can be designed to emit over 30% more light than the brightest OLED TVs. This means that LCD TVs perform better in bright room environments, while OLED TVs are more suited for dimly-lit or light controllable room environments. OLED is similar to Plasma in that the pixels are self-emitting. Also, just like Plasma, deep black levels can be produced. However, like Plasma, OLED is subject to burn-in. Also, as it stands now, OLED displays have a shorter lifespan than LCD or Plasma displays, with the blue part of the color spectrum at most risk. Also, getting down to the nitty-gritty, large screen OLED TVs are higher in cost in comparison to LCD or Plasma TVs. On the other hand, OLED TVs display the best screen images seen so far. Color is outstanding and, since the pixels can be individually turned on and off, OLED is the only TV technology that has the capability of displaying absolute black. Also, since OLED TV panels can be made so thin, they can also be made to bend — resulting in the appearance of curved screen TVs (Note: Some LCD TVs have been made with curved screens as well). OLED technology can be implemented in several ways for TVs. In the beginning, there are two that were used. LG's variation on OLED technology is referred to as WRGB, which combines white OLED self-emitting subpixels with Red, Green, and Blue color filters. On the other hand, Samsung employs Red, Green, and Blue sub-pixels with no added color filters. LG's approach is intended to limit the effect of premature Blue color degradation that was inherent in Samsung's method. It is interesting to point out that, in 2015, Samsung dropped out of the OLED TV market. On the other hand, although Samsung does not currently make OLED TVs, it has created some confusion in the consumer marketplace with its use of the term "QLED" in labeling of some of its high-end TVs. However, QLED TVs are not OLED TVs. They are actually LED/LCD TVs that place a layer of Quantum Dots (that is where the "Q" comes from), between the LED backlight and LCD layers to enhance color performance. TVs that use quantum dots still require a black or edge light system (unlike OLED TVs) and have both the advantages (bright images) and disadvantages (cannot display absolute black) of LCD TV technology. 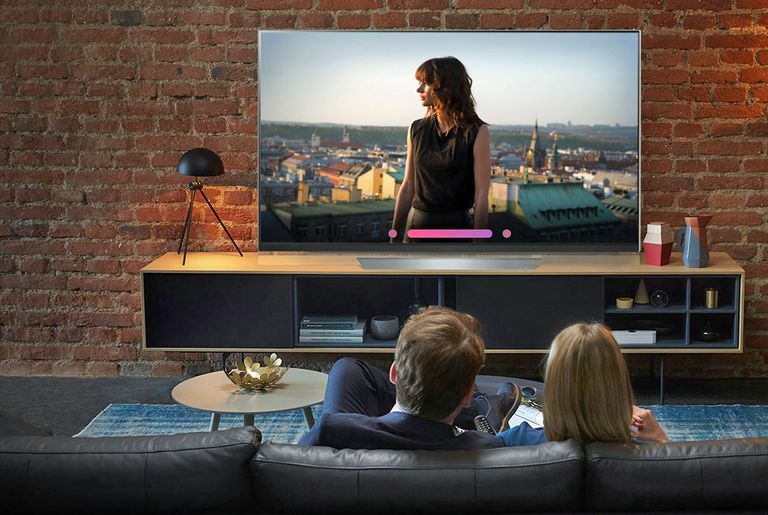 Currently, only LG and Sony-branded OLED TVs are available in the U.S., with Panasonic and Philips offering OLED TVs in the European and other select markets. The Sony, Panasonic, and Philips units use LG OLED panels. Just as with LCD TVs, OLED TV technology is resolution agnostic. In other words, the resolution of an LCD or OLED TV depends on the number of pixels laid out on the panel surface. Although all OLED TVs now available support 4K display resolution, some past OLED TV models were made with 1080p native resolution display report. Although TV makers no longer offer the 3D viewing option of U.S. consumers, OLED technology is compatible with 3D, and, up until the 2017 model year, LG has offered 3D OLED TVs that were very well received. If you are a 3D fan, you may still be able to find one used or on clearance. Also, OLED TV technology is HDR compatible — although HDR-enabled OLED TVs cannot display the higher brightness levels that many LCD TVs are capable of — at least for now. After years of false starts, since 2014 OLED TV has been available to consumers as an alternative to LED/LCD TVs. However, although prices are coming down, OLED TVs in the same screen size and feature set as its LED/LCD TV competition are more expensive, sometimes twice as much. However, if you have the cash and the light-controllable room, OLED TVs provide an excellent TV viewing experience. Also, for those that still Plasma TVs fans, rest assured that OLED is more than a fitting replacement option.